A few rogue extraterrestrials make their way to the source of the music and abduct two high school students from the Tokyo suburb of Kichijoji: an unnamed boy, and a drummer named Rinko from an outrageous girls-only metal club. The aliens needed an emissary with whom to discuss the terms of their revenge, and felt either of these two would serve nicely. However, being unable to choose between them, the aliens simply decided to merge their souls into a single being! Now, working together, the all-in-one pair must team up with the other members of K.M.G. (the Kichijoji Metal Girls) to rid the planet of these eight-tentacled extraterrestrials using the power of metal. It's time to rock these music-hating creeps all the way back to whatever planet they came from! 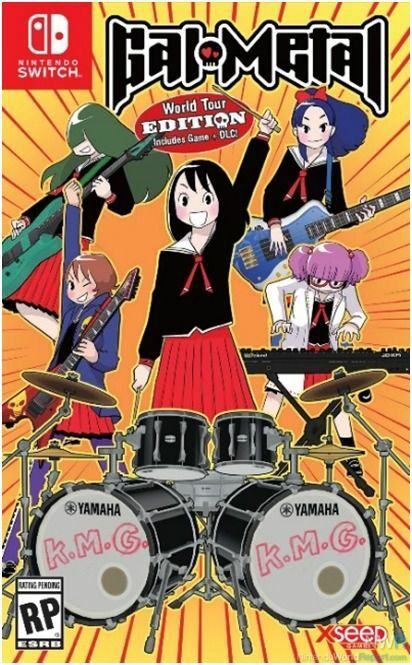 Gal Metal is a rhythm game designed for Nintendo Switch that turns each Joy-Con into a drum stick. Players will take hold of the Joy-Cons to rock along with the music as they create their own complex performances and rack up millions of points using personal free-form drum lines based on over a dozen different beats. With Pro Controller support on offer as well, players will be able to choose how they want to jam and earn metal power to use against the alien invaders in this uniquely adlib-friendly rhythm experience. Jam Any Way You'd Like: A new spin on traditional music gameplay, Gal Metal lets the player create their own drumlines based on over a dozen beats. Practice the beats after school and rack up unique combos to blow the invading aliens away in live performances! Unique Storytelling: Divided into episodes ending in climactic concerts, the lighthearted story unfolds in text messages and animated manga panels that are read right-to-left for an authentically Japanese experience. Be an After-School Specialist: Between performances to take out the pesky aliens, there's ordinary school life as well. Improve skills and friendships by doing part-time jobs, hanging out with friends, and jamming in the club room. Show Your True Mettle/Metal: Simple-to-learn gameplay allows players who master the beats to create complex performances. How much metal power can you score?